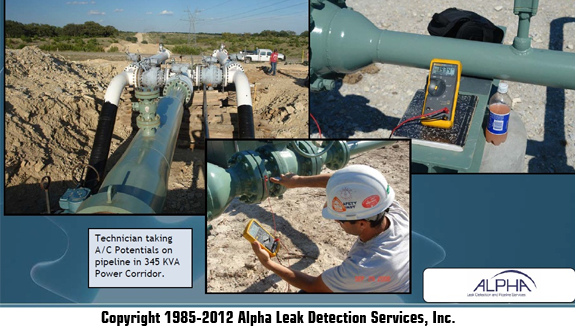 Alternating Current Voltage Gradient (ACVG) Surveys - Alpha Pipeline Integrity Services, Inc.
Home » Alternating Current Voltage Gradient (ACVG) Surveys - Alpha Pipeline Integrity Services, Inc. Alternating Current Voltage Gradient ACVG surveys are used for an indirect inspection tool as part of the ECDA program on the line. Through the use of Pipe Current Mapping PCM, which through the use of this transmitter can pin-point coating anomalies and evaluate the protection of the pipe coatings. This process is very similar to the DCVG process except ACVG evaluates the coatings on pipelines by using a signal generator for alternate current. Stray current can travel along structures and land on grounded lines causing serious damage to the pipeline. Our NACE certified technicians can monitor and mitigate stray current with tools that can keep your pipeline assets safe. By using this signal generator connected to the pipeline and another external structure (i.e., ground bed or cathodic protection rectifier) and through low frequency, an A/C signal will be produced which will in turn pin-point coating anomalies along the pipeline.